A Year of Being Here: Tamara Madison: "Behaving"
and it has resisted. It will not see the obvious. where they cannot help but see. and the world feels for this moment bathed in grace. At last, I realize, the world is behaving. At last, says the world, she is behaving. "Behaving" by Tamara Madison. © Tamara Madison. Text presented here by poet submission. 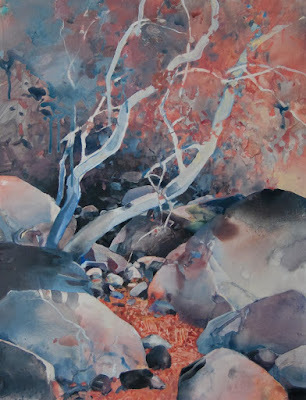 Art credit: "Tahquitz Sycamores," watermedia on Yupo, painting by Randall David Tipton. Yes. It's an almost instantaneous cure for those moods, to "go out and walk upon the road, and quit […] the brick-built den" (James Stephens).